Saint Ita, "the Foster Mother of the Irish Saints," was born in the fifth century. She, like many of the Irish saints, was of the nobility. Her parents were devout Christians who lived in County Waterford. She founded a school and convent at Kiledy (Cille Ide) which still bears her name near Newcastle West in Co. Limerick. A holy well still marks the site of her church. When she decided to settle in Kileedy, a local chieftain offered her a grant of land for the support of the convent. St Ita accepted four acres, which she cultivated. The convent became known as a training ground for young boys, many of whom became famous churchmen. She received St Brendan the Voyager (May 16) when he was only a year old, and kept him until he was six. She also cared for her nephew St Mochaemhoch (March 13) in his infancy. She called him "Pulcherius," because he was such a handsome child. Many people sought her spiritual counsels, and she also seems to have practiced medicine to some degree. Her life was spent in repentance and asceticism. St Ita once told St Brendan that the three things most displeasing to God are: A face that hates mankind, a will that clings to the love of evil, and placing one's entire trust in riches (Compare Proverbs 6:16-19). 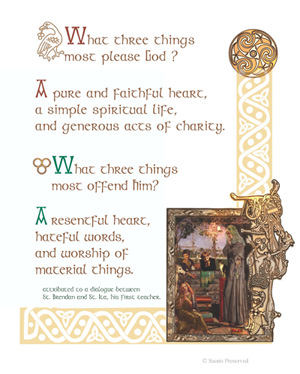 The three things most pleasing to God are: The firm belief of a pure heart in God, the simple religious life, and liberality with charity. St Ita fell asleep in the Lord in 570. Her Feast Day is a local holiday in the district, and her name is a popular one for Irish girls. Free high quality printable pdf. Just click here to download and save.